Casa K is an attempt to reinterpret the contemporary urban Indian apartment in order to create a home that reconnects with natural materials and an understated eclectic 'glocal' aesthetic. The use of rough stone, hardwood, recycled wood, chipboard and textured tiles juxtaposed with dramatic light features, engineered stone and oriental art result in a highly personalised interior that is elegant, reposeful and warm. This Gurgaon penthouse is a study in wood. From wooden floors, oak doors to a dramatic cratewood feature wall that enwraps the staircase: the grains, texture and fragrance of wood permeates every space. Floral white oak decowood veneer plays a leading role in the false ceilings, wall panelling, door shutters and furniture. It has been stained to a dark walnut in the powder room and left natural and oiled in the rest of the home. The beauty of the natural grain and the tonal variations of the veneer form a pleasing backdrop to the collection of Asian Art and antiques that are a repository of memory for the home owners. The living room a calm and composed interactive space sprawls the Rugged Collection Mystic Oak through the walls onto the exterior façade with an extended pool. The Open Kitchen Plan boasts of texture and color of the Oaklava Veneer Nouveau collection holds strong presence energizing the kitchen with color in furniture and light balancing and enhancing the Corian Cantilevered Dining. The Glitz sparkling Grey oak is geometrically patterned to elaborate the veneer panel balanced with a concrete bed in the master bedroom. The grey tinge Veneer adds sheen to the space merging the freshness of inside outside. 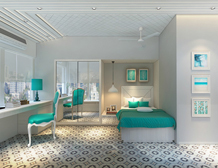 A warm energetic youthful Glitz sparkling Oak room overlooks the courtyard terrace and concrete finish wall unit with splurges of veneer boxes adds drama creating a memoir wall. 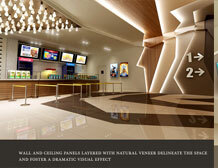 The Natural Veneer wall is designed as art to enhance the personality of the user. 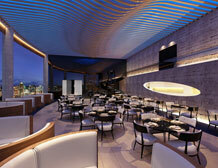 Swirl' is a new-age uber-stylish destination in a high-street in Bangalore for drinks and desserts. The main design element in this modern Lounge Cafe is the edgy and artistic wood work on the walls and ceiling which creates a stylish pattern through the entire stretch of the space. The wood finished fins have integrated lights to add to the drama. The dramatic design combined with the contemporary angular bespoke furniture creates a truly one of a kind experience. The TEAK SMOKED 1 from the MIX AND MATCH COLLECTION has been used for the fins and TEAK DARK GRAIN 1 from the TEAK DIVINE COLLECTION has been used for the Open Kitchen and Back Kitchen Counters. 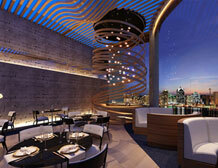 The restaurant design theme was decidedly bold and cosmopolitan. With the clever use of lighting and veneer, we managed to create a dramatic design that not only looked attractive but was functional too. The restaurant enjoys an uninterrupted vantage from the 20th floor and keeping this in mind, we wanted to incorporate the sky in the interior space. We married the natural elements with the design by using blue mood lighting that went very well with the American walnut veneer that we chose for this project. The louvered wooden ceiling that was finished in veneer did the job of adding both oomph and warmth to the space. 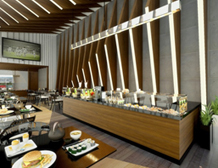 The bar design was the standout design element that is the showstopper of the restaurant. 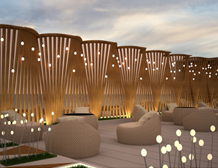 We designed it with bent wood that reached out to the sky ceiling and added star like lights that added a dramatic effect. The use of narrow spotlights on the individual tables while keeping the surroundings dark gives the idea of privacy to guests. The design focus was kept on a few highlighted elements like the bar and the spiral staircase and the rest of the restaurant was decorated with brilliant light effects and sophisticated yet rustic furniture pieces. 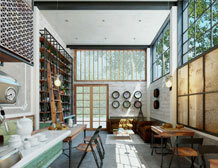 This English Country-style Cafe is one you would feel right at home in. One that looks well loved and well lived in, with each element, material and accessory, carefully picked. We remembered to step back and consider the design as a whole at every addition. 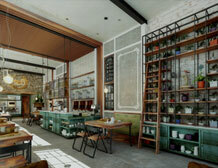 A careful combination of burnt-brick walls, rustic stone and wood panelled walls, distressed painted ceiling and wooden beams, metal and wooden furniture, leather sofas combined with delicate English accessories, this Cafe is a favourite in the city for its sense of loving warmth and comfort. The choice of Decowood Veneers are as follows: The wooden rafters in Natural- Special Collection- Nouveau- Oak Soil The Back Kitchen wall in Natural- Rainbow- Ash Dyed Green Apple The shelves in Natural- Rainbow- Koto Dyed Grey and The Tables in Natural- Crotch Mahagony finish. 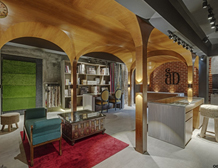 The upbeat and contemporary spirit of AD Boutique – a fabric/drapery retail store is expressed in their new flagship store nestled in the heart of Bangalore city. The modest space of 650 sqft is celebrated with an accentuated idea of the arched windows with drapery of the by-gone era which is represented in the most quintessential form, the “Arch”. 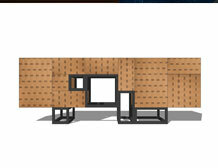 The arch is structured in flexible plywood and finished with Jatoba veneer from Decowood. The grains of the veneer were used in several combinations such as the relatively flat surfaces were treated as one element with the dynamic grains going across the space and the curves had linear grains going perpendicular to the flat surface enhancing the arch visually while it takes the colossal monolithic form to hold the complete interior space together. The design further trickled down through the square columns as structural elements where the linear grains continued. 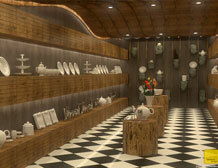 While the entire backdrop of the store is guaged by the waves in the ceiling and falling down on the walls using Glitz Sparkling OAK, the shelves used to display the crockery are rustic and made of uncut natural stones. The stone helps in highlighting the product and also does not take away the attention from the exotic wooden grains of the Oak. The side walls continue to showcase and maximise the display space against a background of Ash Dyed Grey that is in sync with the colour of the natural stones and helps in highlighting the elegant crockeries. Meticuolously crafted together Pitter platter deserves a Win! Being one of the later entrants to the business, the Client brief for the décor of the lobby was to transport the viewers to the virtual world of fantasy and awe, even before entering the Auditoria! Thus, the delineation of the space feels as if it has ‘Blasted-Out from a Solid Block’, rather than being perceived piece by piece. The dominance of non-coherent lines, feels continuous and yet non-intersecting. The layered walls continue seamlessly, blending onto the ceiling and the floor, creating unconventional, ‘Unboxed’ and unpredictable patterns. 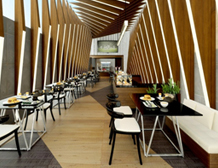 The design uses ‘peels of veneer’ creating continuum of floor-wall-ceiling, much on the lines of a futuristic film set. Fossil Oak (Naturals Standard) of Decowood veneers have been used to accentuate the journey from the lobby to the Auditoria, and make the space memorable! The interiors of a government officer chamber has been lavishly designed reflecting the charisma of the eminent personality and his status. 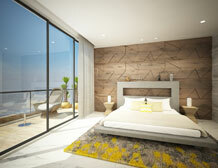 The space is luxurious and sophisticated with a gentle blend of contemporary style. 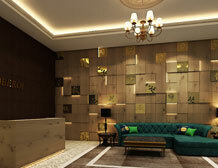 This was achieved by elegantly incorporating the use of Decowood Golden Wenge, from natural range. The Ashleys stand for a refined sense of detailing and elite customization that defines the marked edge that design can bring to a product, space, structure or even detail. The two word brief which the client spelt out was Palatial Luxury. 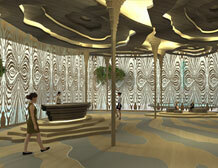 We chose to take the Project one step ahead by blending an Indian sense with Contemporary Design. The goal became to bring in a sense of “Fusion” taking Indian Craft of Fine Carving and Detailing to a Global Platform. Gold carving have been subtly blended with neutral palettes of veneer to bring in strong luxury accents without crossing the line of being outlandish, and to add to it, it has been provided led lights across the wall The veneer used here is Ruglead Collection Artic Oak, for the walland the tabletoo iswrapped in the same veneer. 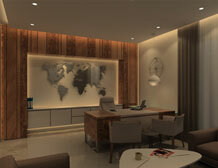 Interior rendered for a project contractor’s office for which the quality of construction is priority. Based on the client’s profile and nature, PipaliYa in DesiGn chooses an open office planning with combined with hi-end materials & contemporary feel to create a sense of modernity. Materials used were a combination of veneer and wallpaper panels of full height to create stunning effect of space as you enter. The pallet used was natural colors combined with stark finishing depicted through rose gold finish on metal section & glass films. The directors cabin most functional yet the material choice is class apart. 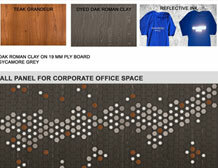 Each workstation is filled in space with fine balance of visual splendor with necessary functionality. A variety of tones Decowood veneer surfaces are created with underlining the hierarchy of each cabin. Simplest way of communication is established through material pallet & size of each workstation based. 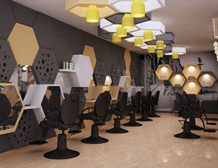 This Upcoming cheerful unisex spa & salon offers a wide range of services such as Hair cutting, styling & Hair care ,spa treatments with other beauty treatments. 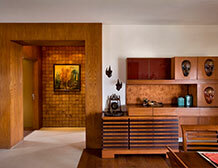 Use of Deco wood Veneers made this space more attractive with real wood finishing . 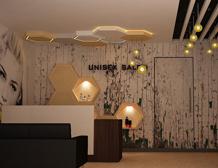 Mainly combination of three different colors and textures of veneers has been used for the wall paneling and false ceiling along with the partition walls. We have selected the Rainbow from the series of Naturals with Dyed kotto white to play a contrast in hexagonal design.Use of Decowood veneers with wall paper gives a different look to the project. 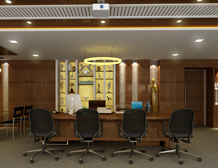 Veneer are used in Wall paneling,False ceiling & Furnitures which added the richness to the modern and beautiful interior. The Veneer, a thin layer of the wood and is in “essence” a facing representation of a wood block. 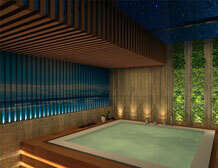 This essential quality of the veneer is used as the main concept of the spa. The translation of this is observed in the laser cutting of the veneer capturing the crowns and knots, which is an intrinsic nature of the log of wood. These thin sheets of veneer are then sandwiched in glass panels and then used as screens or partitions forming enclosures. This is observed at the entrance atrium as well as in the creation of the box therapy rooms. The entrance columns is designed using the veneer around the structural elements to form the rotunda of arrival . 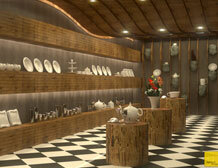 The flooring and the ceiling enhance the topography of the space and highlight the raw qualities of wood. The plunge pool is the space where the spirit of dynamism and mysticism is created through the weaving of veneers and also adding grooving techniques to veneer to create additional patterns onto it. HD COLLECTION-UV PLUS, TEAK LIGHT GRAIN-EPOXY PU FINISH, and VINTAGE ROVERE GREY-CLEAR PU FINISH is designed to create the sensorial experience. Inspire from the origami craft, the deco wood Veneer is conceptualized to create a modern space divider for a lounge space. The design intent is to challenge the traditional approach of diving a space using dense wooden dividers by adapting it to a more playful contemporary form. 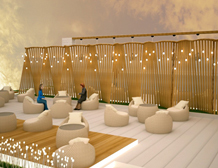 The structure also has integrated lighting to enhance the ambience of the lounge. The long divider is designed as units which can be repeated to increase the length as per the requirement. Deco wood golden teak is used for the divider since, Considered as ROYAL, recognized for its durability and stability, High oil content. Great Beauty, fine to coarsely grained even texture, medium luster and an oily feel. 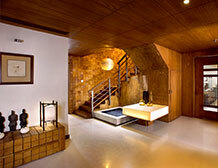 As per the design and space, golden teak easily blend with the form and thus enhance the aesthetic of the space. Squarefoot was designed straight out of a square notebook. The design exercise was a series of explorations of covering certain grids of a typical square notebook page and further multiplying it into three, four, five grids, horizontally and vertically. To give this piece a dramatic makeover we chose the special blocs veneer from the special collection. Different directions of veneer cladding are used on each drawer and shutter for the cabinet. The mild steel leg structure was designed to fit into the negative spaces discovered upon creation of the grids from the notebook to give the entire piece a light and minimalistic look. We suggest this piece in a Scandanavian style apartment, complete with books, CDS, games and everything else one needs in their entertainment room. The wall panel is inspired from visual movement or flow. 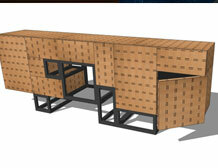 The design approach is to represent flow through hexagonal units made from deco wood veneers. The units are layered to create a 3 dimensional surface. 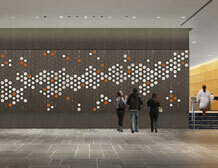 The scale of the art installation creates a dramatic visual effect in the lobby of a corporate office. Base of the wall panel is Dyed Oak Roman Clay on which hexagons have been created using etching technique. This creates a hexagonal grid all over the veneer surface. To create a flow effect, Dyed Sycamore and Teak Grandeur have been cut into hexagonal pieces and have been placed on the surface. At places, in the graphic small hexagons have been screen printed on the surface using Reflective ink. Reflective ink is made up of tiny glass beads which are inserted in the ink. When light falls on the surface of Reflective ink, it shines even in dim light due to its reflective properties. In a corporate space, when this panel is installed it creates a layered flow effect with its variation in color of veneers and reflective ink. Surface techniques of etching, laser cutting and screen printing used to create a 3dimensional layered surface. The veneer surfaces are polished with matt finish. 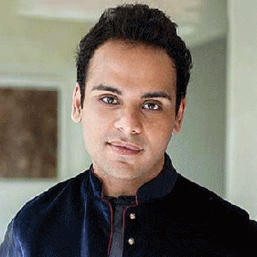 Ashiesh is an award winning architect and interior designer with many accolades to his name. With an impressive array of projects such as Le Mill, Nido and Otlo under his belt and multiple cover articles in The New York Times, and other prestigious periodicals and magazines, he has created his own niche in the highly competitive world of design. He has also been a jury member for multiple awards and has also been featured as the '20 people to watch out for in the year 2011' by CNN GO. 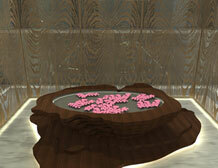 Ashiesh's work reflects his ability to fuse an international aesthetic with Indian sensibility. 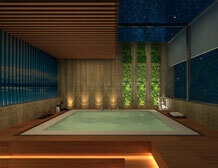 Canna is an architect and interior designer with over 28 years of professional experience. Having completed her Bachelors in Architecture at CEPT, Ahmedabad she did her Masters at University of California Berkeley, US. She is the Chairperson HCP Interrior Design Pvt Ltd (HCPID). Her nationwide reputation and renowned signature style of designed interiors, seamlessly blends with architectural forms and spaces. 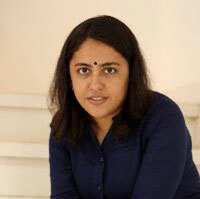 Canna has been a recipient of several awards in recognition of her work and dedication to the profession, which includes Women Architects and Designers of India in May 2016, Women Achivers Awards from JSAF in 2013, IIID MK Award in 2007, Udgam Achiever Award in 207, among others. In February 2015, she was appointed as Academic Advisory Board for the School of Enviornment Design and Architecture at the Navrachana University. Pinky founded Modus Design Studio in 2012, which provides architecture, planning and interior design solutions for both residential and commercial spaces. 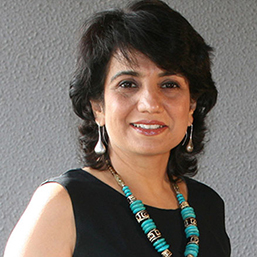 She graduated from IED School of Architecture, Vadodara and has over 23 years of experience. She started her career with Space Design Associates where she was involved in various projects. Since the beginning of her careers, Pinky was famed for her eye for details and her exceptional skills and aptitude in interior design. 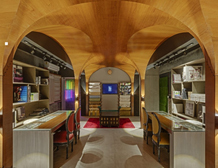 In April 1999, she along with Rasik Bahl, one of India's leading architects launched an architecture and interior design firm called THE Guild of Architects. It was formed with the primary objective to create value, excellent detailed designs, on time and within budget delivery of projects. Since then, there has been no looking back. She has worked on diverse assignments in terms of scale, typology and design. 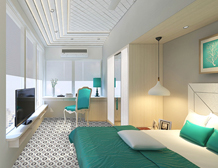 She is one of the leading architects and interior designers in hospitality and luxury residences in the country today. In his 29 years in the industry, Ambrish has worked in diverse fields including boat building, cinema, museum and exhibit design. 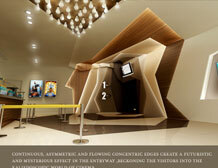 He founded Studio Lotus in 2002 with architects Sidharth Talwar and Ankur Choksi. 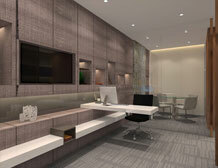 The firm specializes in architecture and interior design and has created a distinguish corpus of work. Over the years, they've received many awards namely the World Holiday Building of the Year at WAF 2011, World Architecture News Hotel of the Year in 2013 and a nomination in the Aga Khan Award cycle 2013, the Hong Kong DFA Grand Jury Award 2012, the iiiD Design practice of the Year 2009 and 2011 among several others. Studio Lotus' multidisciplinary team of 45 highly committed individuals work on the principles of conscious design- celebrating local resources, cultural influences and a keen sensitivity towards the impact of the process on all stakeholders. 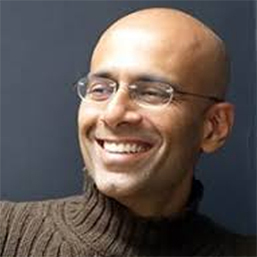 Ambrish is a fellow of the Royal Society of Arts, a member of the CII National Design Committee, on the advisory board of the Ansal University and has served as a juror for several awards and university panels. Copyright © 2017 Greenlam Industries Limited. All rights reserved.